In a desperate attempt to get some crosstalk and comments on this blog, I was going to start off this post saying that I feed my dogs Old Roy dog food from Walmart and I think it is the best dog food around…however, I don't want anyone to read just that line and go buy that food and feed it to their dogs. I do not, have not and will not feed that food to my dogs. I do love talking to people about what they do feed their dogs. I love how passionate some people are, and how knowledgeable the public in general is getting about dog food. It can be a real journey…deciding what to feed your dogs. My journey has taken me from feeding my first shepherd (who I had while I was in my early 20's and admittedly ignorant) dry dog food and pretty much whatever I was eating that day (shame), to a raw diet, to now cooking meat and veggies for my babies and supplementing their dry kibble. At one point in time I had 4 different kinds of kibble to cater to each of my dogs needs… no grain, no chicken, small kibble, big kibble… it gets exhausting. I realized it was exhausting for them as well when I would put down these bowls with meat, actual meat in it and they would sniff and walk away. UGH. We have now worked out a menu plan that works for everyone, and my husband doesn't constantly grumble that I spend more time on the dogs meals than his. pumpkin- it is very good for their digestive system, and their eyes, and their coats. You can buy the canned pumpkin seasonally at the grocery store. Make sure you get the plain pumpkin, not the pumpkin pie filler. You can also get or grow fresh pumpkins and roast it and freeze it. 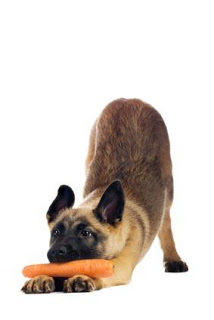 carrots-depending on the size of your dog, you can just give them whole carrots to munch on. It is great for their teeth and eyes. peas-throw a handful in their food. It adds flavor and is good for them. The type of dry dog food you choose for your dog is so important. I know that many dogs across the country eat dog food from the grocery store and do just fine. Personally, I want all dogs to thrive. At GSROC we have learned that feeding a higher quality food that is more in keeping with what dogs have evolved from helps to reduce any proclivity the dog has to allergies, ear infections, digestive problems and a plethora of other health issues. We have also found that higher end foods have much less “filler food” in them so you actually feed less… and clean up less messes. You all know the saying…”you are what you eat”. We would love to hear what you think about dog food. 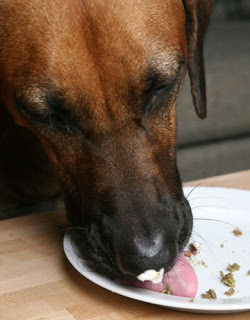 Do you feed your dogs a raw diet? Do you give your dog “people” food? Have you ever had a dog with allergies and how did you work out it out?